Estate Planning, as we come to understand through reading this series of posts, is an important – and sometimes complex – process: estate planning with a testamentary trust may appear complicated, but when compared with the confusion and complexity that can arise in certain family situations, is an estate administration simplification tool. A testamentary trust is a trust established under the terms of a Will. It is usually reasonably discretionary in form; and only comes into existence on the death of the testator. 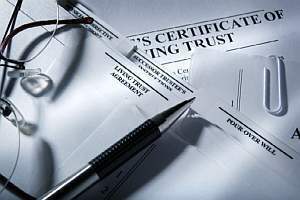 In many respects, the role of the trustee of the testamentary trust is not unlike that of the trustee of any closely-held family trust: the terms specified in the Last Will and Testament of the testator will dictate the activities so as to best benefit their intended beneficiaries according to their wishes. Like any trust, a testamentary trust can be as flexible or as fixed as the testator decides. The trustee can be given full discretion or indeed no discretion, as to who should receive income and capital from the trust – and when they should receive it. Why are testamentary trusts used in estate planning? (Potentially for) avoiding an unintended loss by a beneficiary of their Government sourced pension or other benefit. Who controls the assets held in a testamentary trust? As with any trust arrangement, the control of the assets in ‘a trust’ is in the hands of the appointed trustee. In the course of an estate planning exercise, the testator will nominate in their Will, the person they believe most suitable to act as trustee (and consequently to control the trust assets). The trustee may be the same person who was appointed as executor and can also be a beneficiary. For example, a parent can establish a testamentary trust for each child’s inheritance. Each adult child can be the trustee of their own trust (although there may be reasons, to be discussed with your estate planning lawyers, to make appointments exclusively). Once the executor (legal personal representative) properly transmits/ transfers assets from the estate to the trustee they are no longer estate assets as such and a different process of administration commences. The following illustration shows the effect of including a testamentary trust in the estate plan. Let’s assume that someone died at point X. The executor’s job involves finding all the assets, paying out any debts and usually, at point Y, distributing the remainder (what is left) to the beneficiaries. NOTE: A Will can establish more than one testamentary trust. Where can I get help with Estate Planning? provision of access to our referral connections of such professionals (to whom we are happy to refer you to match their expertise with circumstances such as your own). The experienced advisers at Continuum Financial Planners Pty Ltd are available to guide you through the preparation of the information to refer to a legal adviser (estate planning specialist) and where necessary, a taxation specialist, so as to ensure that all relevant detail is provided to them to ensure your estate planning strategies are determined as effectively as possible. For an appointment to get your estate plan started, call our office (on 07-34213456), or use our website Contact Us facility. Estate planning dependent on a valid Will.